Welcome Steffen, a new Nothing-In-The-House correspondent who sent me this pie anecdote from his home in the Hudson River Valley (HRV) of New York. Steffen told me once that he was into "19th century pies," or perhaps the quote was "old-timey pies." Look forward to more pie posts from him. Pie made for 84 and 85 year old hosts on the banks of the St. Lawrence seaway this weekend. Fortune (Schoharie Spy/Empire cross) and Black Twig apples. Black Twig being high on my list of good apple names. Tasty too. Fortune apples behave in a pie. Butter/Flour crust, kept it simple because elders can tell when Pie Is Adulterated. This pie was titled life-is-suffering pie for Moira, who is in that mode currently. It's officially pie season from hereon out, so you'll be on my radar. This pie embodies the pie spirit of darkness -- often overshadowed by the twee wholesome cliche of American Pie. But pies are actually really goth, if you think about it: berry juice looks like blood, sometimes scary blackbirds and ravens fly out of pie crusts, and pies are totally old timey (and everyone knows that in olden times people were dying of crazy things constantly: see Oregon Trail, dysentery, and cholera). I bet EA Poe just loved a pie. Thanks for bringing the pastry back to its roots. YES. I completely agree. The name for this blog comes from Great Depression pies, where ingredients like crackers and rancid meat were hobbled together when there was there was nothing-in-the-house. 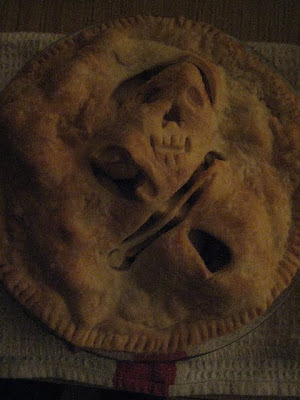 Also see the "funeral pie" posts from a few years back. And the etymology of the word pie apparently comes from "magpie" a rogue of a blackbird who steals from other birds nests and eats their young. Pie is DARK. Just another reason why I love it. And why I love Heather Radke and her "olden times." p.s. I am reminded of the occasion, Miss Radke, when you once feigned berry juice for blood. Summer Solstice ceremony 2005... "don't worry about it."